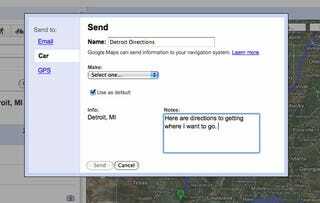 The ongoing battle between GM's OnStar and Ford's SYNC reaches a new level with Ford planning to announce later today they'll offer Google Maps direction service for free to customers with SYNC system. The free "Send to SYNC" service for its SYNC infotainment system, allowing users to send directions from Google Maps straight to their car via the company's Bluetooth-based traffic and information system. The only catch is you'll need to have the Ford Traffic, Directions and Information app installed and a Bluetooth-enabled phone to stream the information into the system, but that's not much of a catch since Ford's main approach is BYOD (Bring Your Own Device). Other than the cost of using your phone's voice/data plan the system is free because it's BYOD and, if it's like the Mercedes subscription service, it should be straightforward to use when it launches later this month. Just select the "Send To Car" option on Google Maps and add the number for the phone you plan to pair to your car. It's one less distraction to worry about while you're trying to get SYNC to play a Modest Mouse song instead of giving you the weather conditions for Billings, Montana.